Meathead Movers is here to take care of the heavy lifting for you on your move with our top-rated Chico movers. Our clean-cut student athlete movers are ready to get you safely settled into your new Chico home. Other Chico movers can’t compare to our level of service and our quality of work. Whether you are moving to Chico for a job or to be a part of the lifestyle, you’ll want to check out the services that Meathead Movers has to offer in your new stomping grounds. Chico is a beautiful and scenic city in northern California’s Butte County. It is a nature lover’s paradise. Nicknamed both the “City of Trees” and the “City of Roses,” Chico is full of beautiful parkland. Visit Bidwell Park for hiking, biking, horseback riding, paragliding, disk golf, star gazing, or even take a dip in Big Chico Creek. The city is also a great cultural and educational center in Northern California because it is home to Chico State University. The city has also seen a recent growth in the number of retailers who have set up business within the city limits, making it a popular shopping destination. 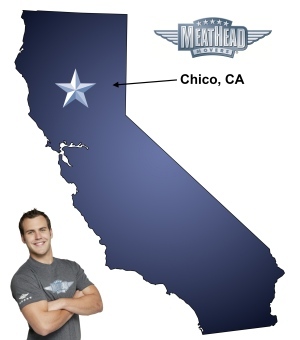 If you are considering a move to Chico, check out Meathead Movers! We specialize in both local and long-distance moving services. Unlike other Chico movers, all our movers are put through a careful screening and rigorous training process before we allow them on our trucks. Our movers are respectable, clean-cut student-athletes who are drug-free, non-smoking, and devoted to providing you with the best service possible. We will always showcase our signature Meathead hustle by jogging whenever we aren’t carrying your items to and from the truck. We won’t blame you if you don’t want a Meathead packing away your fragile items. Let our sister company, Princess Packers, help you out. All our packers are professionally trained to ensure that your items make it safely to their final destination. If you need additional help during your move, try our moving concierge service. We’ve researched and carefully selected a wide variety of individuals and companies that can make your move easier. No matter if you need a junk hauler, a babysitter, a house cleaner, a security system technician, a landscaper, or a carpet cleaner, we can recommend an excellent service just for you. We will take care of everything you need done so that you can focus on getting where you need to be. Moving to Chico doesn’t need to be a huge hassle. Unlike other Chico movers, Meathead Movers offers a help line and moving support every day of the week. Give us a call today to learn even more about our services and what the Meathead Difference is all about. We can also provide you with a free, no-pressure moving quote. To top it all off, we’re the only moving company in California that offers a 100% satisfaction guarantee! Moving to Chico? Here are some helpful resources. “Your company provides us the flexibility to get our seniors relocated in a timely manner, sometimes we do not have much notice and Meathead Movers always is there for us. Provide a more accurate estimate of weight and space. The communication was excellent (and encouraged) from the day we got our estimate until the day the truck was all unpacked and drove off. We were able to get next day delivery on a 500 mile move (other companies were telling us 3-4 days), everything was on time, the crew was very careful with our things - they wrapped our furniture really well and worked non-stop while packing and unpacking the truck. The truck and moving supplies were really clean. We had a very respectful team; friendly, hard-working, organized, and very nice. Thank you! You made this stressful task so easy!